I am a 44 year old father of 2 boys who are both dedicated anime fans. 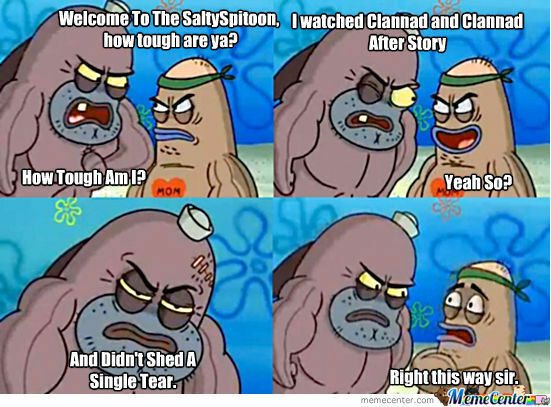 I became a fan after looking for something to watch on my Kindle and stumbled across “Clannad” and “Clannad – After Story”. This began my my quick descent into the world of anime. I am not a professional writer, or a good writer, by any means. this is just a way for to me to get some ideas out into the world for no other reason than I want to. If you enjoy, please read. If not, move along: no time to waste on something you don’t like. I haven’t seen it. I have heard about before. I will have to check it out. Getting the two boys to sit down at the same time to watch the same thing is a challenge. 🙂 My older one spends a lot of time currently making fan dub- translations of various anime OPs and EDs. And the younger one is currently on a Naruto kick (I can’t do the really long form shows). Clannad is a great series. I’m glad the sad moments didn’t scare you off from watching more anime. I love that series, just purchased the DVDs even. 🙂 It holds the special place in my heart as being the series that really brought me into watching anime. Have you heard of myanimelist.net? Yes! I never signed up for the forum however. I never really go on the forums but it’s a great resource for all things anime but I think its #1 feature is having a list. I can never remember what episode I’m on. I do use it for looking up shows I am not familiar with and reading reviews. So I do use it some. No, I haven’t even heard of it (I don’t think). Thanks for the recommendation! I’ll keep an eye out for it.